An Astronomy Day took place on the 29th of November in the National Museum of Flight in Edinburgh, and StrathSEDS were lucky enough to be invited along to host a stall. 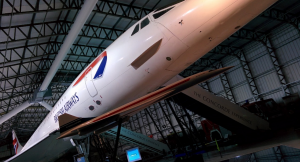 The event took place in the main hangar of the museum, and amongst the things on display was one of the few remaining Concorde Jets. While it was an amazing sight that would attract many visitors, it was also quite intimidating “competing” against this marvel of engineering for peoples attention. We took a few rockets along with us, as well as the StrathSat-R project, which was completed by StrathSEDS Alumni who have now gone on to study postgraduate degrees at the University. There was a lot of interest in the StrathSat-R project as we were able to display actual mission footage. Our stall was only a small segment of the range of stalls at the event. With it being an astronomy day, there were a number of stalls showing other aspects of space exploration such as amateur space photography, a stargazing tent and even a “build-your-own” Rosetta station. The latter of which proved to be very popular – because who wouldn’t want to have their own paper model of the equipment used in one of the most important space exploration missions in recent years! While the weather wasn’t on our side for the whole day, there was still a great turnout of people who were eager to learn about space. These included Sean Wixted, a Scottish parliamentary representative, and our old buddies from rocketry all of whom weren’t deterred by the “beautiful” Scottish weather. Overall, it was a great event that allowed us to meet a few really enthusiastic members of the space sector, and gave us a chance display projects that we had been working on. Are you a UKSEDS branch with an exciting story to share? Get in touch at [email protected]!